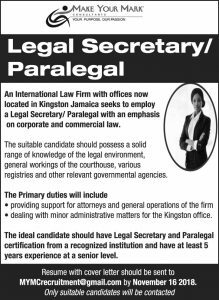 An International Law Firm with offices now located in Kingston Jamaica seeks to employ a Legal Secretary/ Paralegal with an emphasis on corporate and commercial law. The suitable candidate should possess a solid range of knowledge of the legal environment, general workings of the courthouse, various registries and other relevant governmental agencies. dealing with minor administrative matters for the Kingston office. 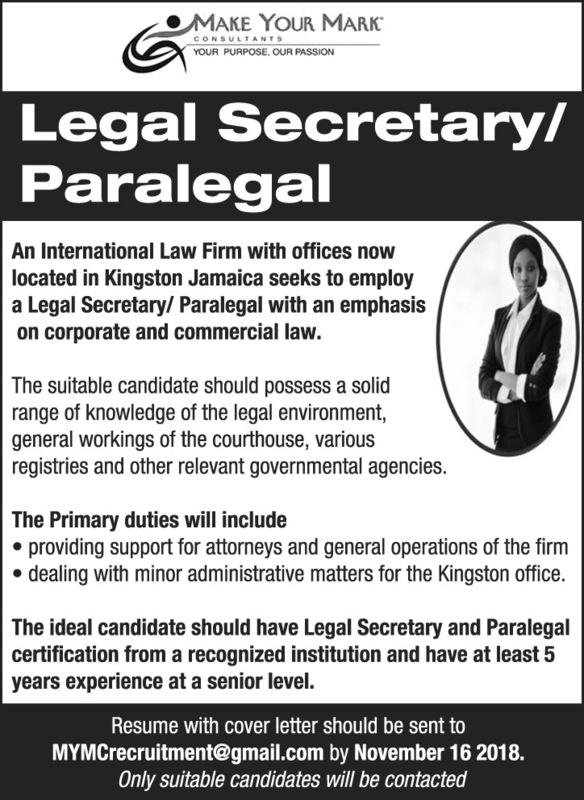 The ideal candidate should have Legal Secretary and Paralegal certification from a recognized institution and have at least 5 years experience at a senior level. Resume with cover letter should be sent to MYMCrecruitment@gmail.com by November 16 2018. Only suitable candidates will be contacted.